A picturesque and charming finca, Las Rosas is located at the foot of the hills between Puerto Pollenca and the sandy beaches of Cala San Vicente. The main property consists of two double bedrooms, both en-suite. There is a cozy atmosphere attached to the lounge and fitted kitchen, both lead onto a paved terrace that surrounds a large and ornate swimming pool. (15mx6m) The guest house, attached to the main house, comprises a double bedroom, bathroom and lounge all with garden and pool views. As its name suggests, colorful and fragrant flowers adorn the entrance to Las Rosas, and adjacent to the pool and landscaped gardens, maintained and secluded lawns are ideal for children or sunbathers. The sheltered barbeque area always enjoys the evening sun, making it a romantic spot for ‘Al-fresco’ dining. The ‘Mallorcan’ tiled sun deck provides a spectacular setting, overlooking the Mediterranean fruit tress and grape vines that adorn the private grounds. Less than a 10min walk to restaurants. Mallorca/Pollenca: A 45 minute drive from the airport and Palma in the north of Mallorca lies the delightful municipality of Pollensa and the Port of Pollensa / Puerto Pollensa – a spectacular combination of sandy beaches, turquoise crystalline waters and beautiful countryside against a backdrop of stunning mountain scenery. As more and more people are discovering, Pollensa in Majorca is a delightfully unspoilt haven enticing families and couples to return year after year to this ideal holiday spot. Puerto Pollenca/Cala San Vicente: The picturesque countryside around Pollensa is a colorful mixture of fertile fruit orchards and lightly wooded glades, bordered by hills to the south and dramatic rocky outcrops of Mallorca's northern mountains. Contained within ten square kilometers, the region stretches along the coast to Alcudia from the golden beaches of Puerto Pollensa and inland to the quaint, historic small town of Pollensa itself. To the north the shores of Puerto Pollensa and Cala San Vicente are fringed with kilometers of golden sand with water sports and ideal sun bathing for the more relaxing holiday. Both Puerto Pollensa and Pollensa offer a good selection of restaurants, ranging from cafes and tapas bars to fine dining. Pollensa, apart from its pretty square has the Via Crucis which is a notable attraction with its long stairway which ascends Calvary Hill, from which there are superb views over the coast. Puerto Pollensa is a pretty, unaffected resort that is a firm favorite with families. Golf Information: The Pollensa Golf Club is open to non members. The challenging 9 hole courses have been described as some of the most beautiful in the Mediterranean, with a clubhouse, a restaurant which also welcomes non-golfers, a swimming pool, rental of clubs, trolleys and golf cars also available. Tuition can be arranged and there are regular tournaments. WiFi available during your stay and costs £25 per week. Mountain bikes can be rented from just £4 per day. These are rented locally at a 60% discount to local rental shops. Please advise prior to arrival. Mountain Bikes can be rented during your stay. They cost just £4 per day to hire and are paid for locally. Please advise prior to arrival if you would like to rent these. Cot and High Chair are hired locally and cost £25 per week. Las Rosas was everything we hoped for and just as described. It is the ideal property for families, we are 2 grandparents, son and partner and 2 teenage grandsons. The guesthouse was a lovely little getaway for “nana and grandad”, while the main house was absolutely perfect for the rest of the family. The whole property was well equipped and we didn’t want for anything. It was spotlessly clean with bedding and towels provided. It was also warm and cosy on the chillier nights at the beginning of April. The outside patio and bbq area were ideal and we enjoyed a lovely bbq one evening. The pool was amazing but as it is still early in the season, rather cool, although the grandsons did have fun in it. We’ve all returned with a definite Mediterranean glow and it was so peaceful to sit in the garden on the sun beds and enjoy the lovely warm sun in the afternoons. Daniel is the perfect owner, providing explicit written instructions and drawings on how to reach Las Rosas and always ready to answer any queries. We would all love to return sometime in the future and have had an excellent week’s holiday in superb accommodation and a beautiful part of Majorca. I am so pleased that you all had a wonderful stay at Las Rosas and had the good weather to go with it. Would welcome you all back! Fantastic location, brilliant service ! It was even better than the photos !!!!! Weather perfect all week. Daniel had been in touch with us before the holiday, providing directions, information etc and called twice after we arrived to check all was OK. Everywhere was spotlessly clean and the grounds and pool were beautifully kept. There was everything you needed for catering and barbecuing too. Supermarkets, shops, restaurants all within a 5 minute drive or 15 minute walk. We loved Porto Pollensa and spent one day on a private charter boat,around Pollensa Bay and Formentor. Also hired bikes and rode to Alcudia Old Town. Loved Pollensa old town for the market and restaurants! We stayed for a week at Las Rosas as a family of 5. With excellent weather, we were able to make full use of the spotlessly clean pool and and the beautiful grounds. Daniel was very helpful during the planning stages and whilst we were there. I would highly recommend a stay here. I am so pleased that you all had a wonderful time at Las Rosas. I hope you managed to get some cycling done too! We were a family of 2 adults, 2 children and grandparents. The pool and gardens were incredible. The children spent all of their day playing in the pool whilst the grandparents enjoyed the late afternoon sun relaxing on the terrace. The pool goes down as the best pool we have ever used at any private villa....simply fabulous. Inside the house you have everything you need to make the stay home from home. We made use of the bikes at the house to go cycling every day along the cycle path in Pollenca Bay. We had very enjoyable meals out in the Port but our best meal was the one at Las Rosas where we had a chef come along and cook us a selection of food on the BBQ which was a special treat from my parents. Daniel helped organise our transfers which worked like clock work as well. Thank you for your kind words Katie & family. I'm so pleased that you all had an enjoyable stay. I appreciate you passing on the details for the chef too....it sounded like he cooked you all an amazing feast. Thank you so much for your kind words Alastair. I'm so pleased that you enjoyed being at Las Rosas. It sounds like the girls only left the pool to sleep at night! Hopefully you have all left with happy memories from your family holiday. 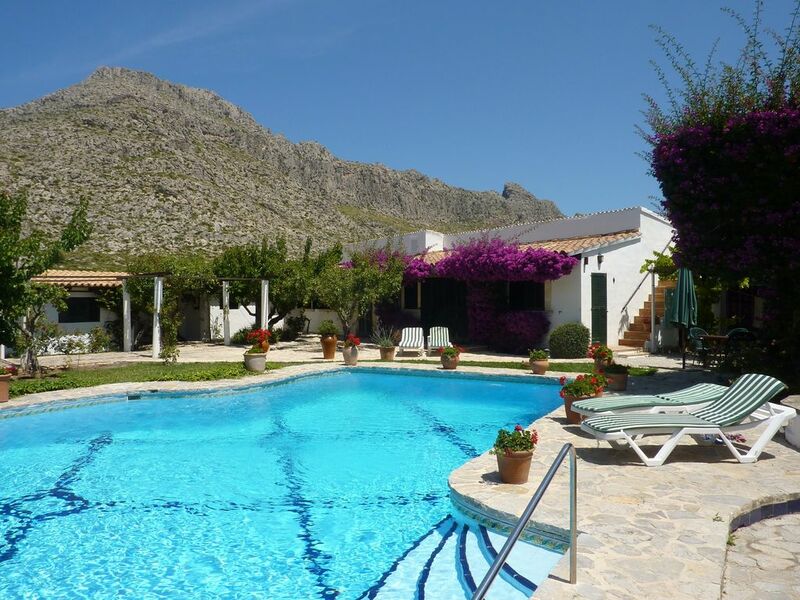 With fantastic soft sandy beaches, beautiful countryside and rugged mountain scenery, Pollenca is the idyllic retreat. Puerto Pollenca, a picturesque resort, which curves around a magnificent bay edged with a fabulous sandy beach, is ideal for families and couples alike. Las Rosas is the perfect retreat, and is just a 10 minute walk to the beaches and restaurants. Very secluded in beautiful grounds. Cot and high Chair rental can be ordered prior to your arrival. They cost €25 per item per week. WiFi access is available to order and costs €25 per week. If you are looking to rent bicycles during your stay then we have the cheapest mountain bike rental in Port Pollenca - €30.